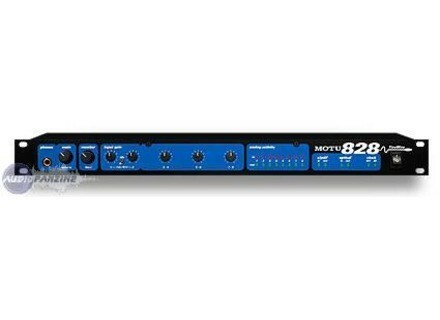 828, FireWire audio interface from MOTU in the 828 series. The Motu 828 interface is run by fire wire and not USB which is one of the reason I took a lot of interest in it. When the Motu 828 first came out all the kept saying is that it was going to change the face of computer integration with audio interfaces and in some ways it did just that. The Motu 828 was very easy to use and to install it on my machine. It was very powerful and I was excited to get rid of my PCI card and get into the new era of audio interfaces via fire wire. I was pretty young when I first purchased this, and really wasn’t sure if I wanted to make the leap from the PCI card that I just bought. But needless to say I have kept this interface all the way till the year of 2010. So it really lasted me almost 8 year or so. I used this interface with Cubase LE for a while and later using it with programs like FL Studio. I didn’t experience any driver updates, maybe I wasn’t aware of them when they came out but for my system I had no issues and no need to update. Even when I switched the Motu 828 to my Quad Core computer years ago, it still worked great and with the same drivers that it came with. Also, the latency on this interface was very low, but I have had lower latency with some newer interfaces. The Motu 828 was very stable and the price when it first came out made it a tough buy at the time because it was not cheap. I had no compatibility issues on either system I used it on. I cant remember the specs of my Dell desktop that I first used it on , but the second computer I used it on was a quad core pc with AMD and it worked perfectly. The manual was easy to use as I remember correctly and it wasn’t to long or hard o understand. All of the main functions of the Motu 828 where right on the unit and easy to use. They have upgraded this interface to the MKII and then the MKIII. I have had a chance to work with both of the upgrades that MOTU has made, but the original Motu 828 has set the standard for the other products they have release. I do not regret my decision to purchase the Motu 828. I bought it with every penny I had saved and got well over my moneys worth.